This Tuli Horse Riding Safari in Botswana, is a true African trail riding adventure, returning to the joys of travelling in the style of Africa’s original pioneers. 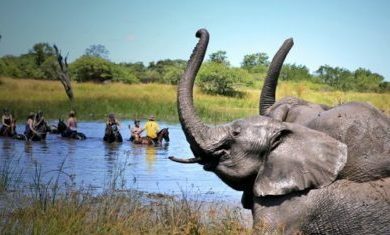 This ‘Land of Giants’, well known for its baobab studded plains and large herds of elephant, is situated in some truly wild landscapes largely untouched by man. The area is home to a variety of wildlife species including lion, cheetah, leopard, African wild dog, elephant, a multitude of plains game like zebra, wildebeest and giraffe, as well as over 350 species of birds. Combining both bush camping and lodge experiences, this 7 night mobile safari allows you to soak up the wonderful luxuries of ‘glamping’ with true African bush experiences. The permanent tented camp of Mashatus, offers a complete bush setting, nestled in a grove of giant Nyala berry trees and just a stone’s throw from the mighty Limpopo River. The tents are raised on timber decks, offering a wonderful place to relax and absorb the African bush, each tent is equipped with en suites and hot showers. Weather permitting this ride offers the exciting opportunity to sleep outside under the star studded African sky in the Kgotla Boma, an unforgettable experience. 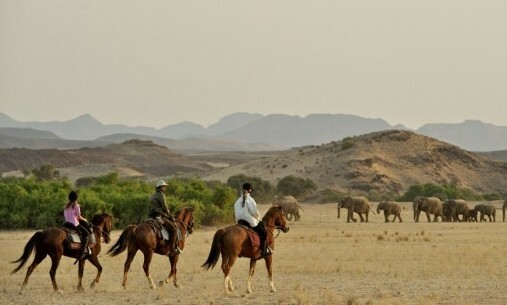 This epic journey, with its brilliant game viewing opportunities, varied and exciting scenery, wonderful accommodation, fabulous sunrises and sunsets, and of course exceptional riding, covers approximately 120 miles over the course of the week and can be scheduled any time of the year. The Tuli Block, or ‘Land of Giants’ as it is often known, is located on Botswana’s eastern border, between Zimbabwe to the north and east and South Africa to the south. 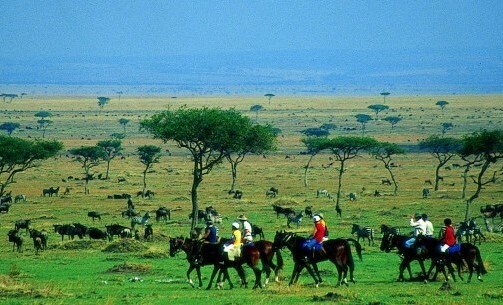 The area is a very protected and conserved nature reserve – known as the Northern Tuli Game Reserve. The beautiful area is famous for its dramatic geographical and geological features, such as Solomon’s Wall by the Motloutse River, and the enchanting rock paintings left by the San Bushmen in the Tswapong and Lepokole Hills. It is an area famed for its wildlife and is home to a variety of wildlife species including lion, cheetah, leopard, African wild dog, large herds of elephant, a multitude of plains game like zebra, wildebeest and giraffe, as well as over 350 species of birds. NB this itinerary is subject to change it is an example and not an exact timetable. The Tented-Camps chosen and route taken may vary from the above examples, also if we have had heavy rains recently or are expecting unusually hot days Kgotla boma will be swopped out for another luxury camps. Day 1: Arrive at the Pont Drift Border Post or Limpopo Valley Airfield, where you will be met and transferred to Two Mashatus stables. Welcomed by an alfresco lunch, shaded tents and an inviting pool – you will feel like you’ve entered paradise! Lunch finished, head down to the stables to be introduced to your new four-legged friend. Mount up for your first introductory ride, once everyone is content with their horse and rider pairings, ride towards camp through the beautiful afternoon light and arrive in time for sundowner drinks. Following a hot shower, dinner is then served in the Llala palm dining room. A delicious meal prepared on the traditional open coal fire by the wonderful chefs – Martha and Grace – both extremely experienced in creating fabulous bush meals! Day 2: Wake up to a glorious sunrise, the dawn chorus, and a steaming cup or tea/coffee brought to your tent, followed by a light breakfast. Ride out in a northwesterly direction, heading for Kanda Camp. 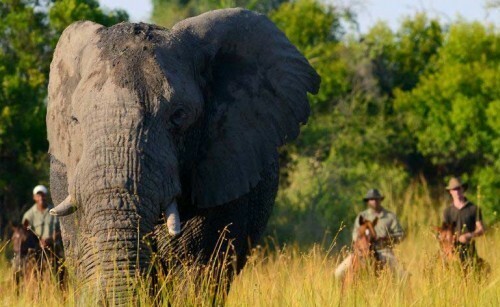 Spend the lengthy morning ride soaking in the wonderful atmosphere of the Botswana bush and exploiting the excellent game viewing opportunities. Pull up at Kanda, a rustic series of cabins atop the steep and shady banks of the Majala River, in time for lunch and some well-earned down time. Once the heat of the day begins to subside, enjoy an afternoon bush walk, escorted by your knowledgeable guides to a nearby sundowner spot. Return to camp for a lovely dinner, before retiring to your comfortable bed, where you can fall asleep to the wonderful sounds of an African night. Day 3: Rise to another beautiful African morning and enjoy breakfast around the campfire. This morning, mount up and test the amazingly sure-footed Boerperde as you cross the basalt rides and following the age-old elephant trails. Enjoy picking up the pace with long canters across the Mopane flats. The ride will cross the Mashatu watershed, arriving at Kgotla Camp in time for a late lunch. Kgotla is an old tribal court from a nearby village that was relocated to the banks of the Motloutse River on the western periphery of Mashatu. The traditional African Kraal is made of Leadwood logs beneath the shady branches of an ancient Mashatu tree. In the afternoon, enjoy a short drive to an easy climb up a beautiful rockface where you are rewarded with a breathtaking view of the Tuli area with South Africa to the South, Zimbabwe to the North and Botswana around you, this is a a sundowner drink you will remember for many years to come. Return to Kgotla for dinner, which will be enjoyed around a large log fire, followed by a night spent sleeping on crisp linen in luxurious beds with your only canopy, a star studded sky. Bliss. Day 4: Following a light and early breakfast, ride out through the Mopane bush in search of elephant. Today there is a choice of either a morning and afternoon ride, exploring the amazing sandstone formations including the famed Solomon’s Wall. Some of the oldest civilizations in southern Africa had their settlements in this valley. 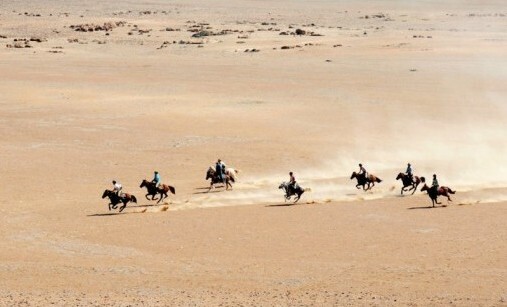 Enjoy long canters through wide open plains. 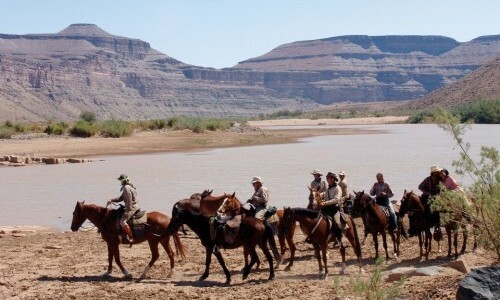 The Mapungubwe topography is awe inspiring, and combined with interesting and exciting wildlife sightings, it is certainly a wonderful riding experience. The group may prefer a long morning ride and an afternoon excursion to the nearby village of Lentswe Le Moriti and the basket weavers followed by a trip to the Mmamagwa hills. Return to the Kgotla for another night under the stars. 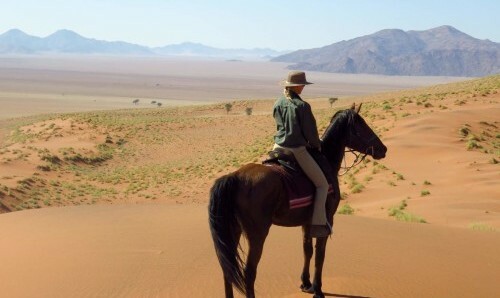 Day 5: Wake up with the sun and indulge in a delicious breakfast, preparing for what is probably your longest day on horseback. Exploring the Mopane bush, keeping your eyes peeled for sighting elephant, you will make your way to the rich plains area close to the Limpopo River. Liana Camp is nestled amongst giant Mashatu trees. This is a true ‘bush’ camp; experience bucket showers, and alfresco dining. This afternoon, set out on an exciting game drive that takes us deep into the reserve in search of the big cats. The area is renowned for excellent leopard, cheetah and lion sighting, so with fingers crossed you will spend the afternoon looking. Pull over for sundowners out in the middle of the bush, and watch the sun sink over the horizon. Day 6: Today, slow things down a bit as you weave and wind your way through the dramatic rock formations that line your return to the base camp of Two Mashatus, spending 5 to 6 hours in the saddle. 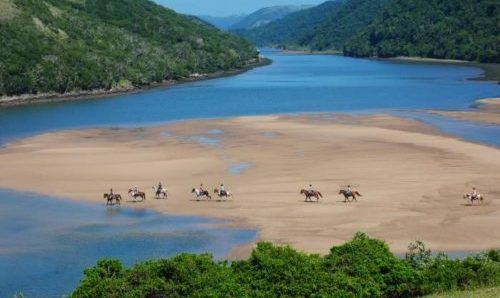 This is a fabulous ride which follows river banks, explores riverine forests, traverses plains and provides those all-important wonderful game sightings. 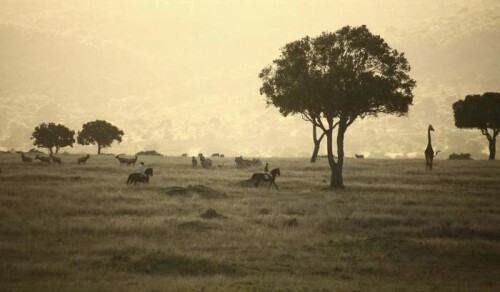 Break in the shade of an old Mashatu tree, where a century ago the Zeederberg transport riders had their midday break. Reach Two Mashatu Camp, and spend the afternoon at your own leisure, relax by the pool and enjoy the comfort of the permanent camp with its shady tents and ensuite bathrooms. Day 7: Rising to the dawn chorus, enjoy breakfast, before heading out for a ride steeped in great history and offering interesting tales of the past. Cross the wide open Pitsani plains, so characteristic of this area and offer the chance for some faster riding - hopefully with zebra or wildebeest! Head for the Majale and Limpopo confluences, where a delicious lunch awaits you. 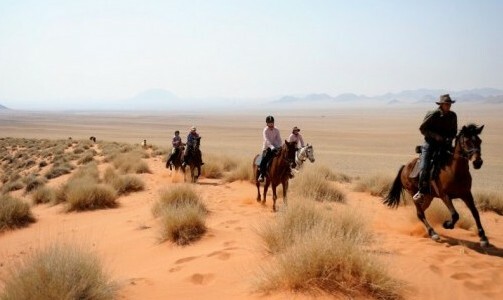 This exciting ride is around 5 to 6 hours and offers wonderful diverse scenery. Dinner will enjoyed back at Two Mashatus camp, and you will sit around reminiscing about the weeks exciting adventures. Day 8: Spend your last morning out in the bush, soaking up the African wilderness, as you explore the dense wooded banks of the Limpopo River. After about 2 hours, return to the stables to bid a sad farewell to your trusted steed. Indulge in one last hearty brunch before getting ready for departure. You will then be transferred to Pont Drift in time for your return transfer to Johannesburg. Open all year round. Rides run from Sunday to Sunday. Please enquire for exact dates and availability. Transfer by air from Johannesburg to Limpopo is £500 return. If the air transfer is not available, a road transfer can sometimes be arranged at £167 per person each way (min 2 guests). This beautiful property is built in the shade of a centurion Mashatu tree. The camp is made up of two traditionally built Lala palm rondavels, which make up with dining and lounge areas, and a series of A-frame walk-in tents. These large and spacious tents are situated on teak platforms, with en-suite enviro loos and hot water showers. Each tent has an air of privacy and is positioned to make use of the shade from nearby trees, each come with a small deck area on which to relax during the peaceful afternoons. The Satellite campsites are set up in specific locations throughout the Mashatu Reserve. Accommodation is in A frame tents on comfortable beds with sheets and duvets. There are hot bucket showers, and ‘bush loo’ facilities. Meals are cooked over a camp fire for a truly traditional experience. The Kgotla is an old tribal court from a nearby community that was relocated to the banks of the Motloutse River on the western periphery of Mashatu. The boma is an open-air traditional African enclosure made up of leadwood logs. Guests sleep on beds around a large log fire which blazes at the centre.